WinPatrol te permite controlar con mayor detalle las actividades de los programas instalados en tu ordenador, como Firefox, monitorizando las áreas más susceptibles de ser "atacadas" por códigos y programas maliciosos (spyware, adware y demás). La interfaz de WinPatrol está dividida en pestañas, cada una de las cuales se centra en una zona determinada de tu sistema: Registro, programas que se ejecutan al inicio de Windows, servicios activos, cookies, etc. WinPatrol además, no sólo se limita a mostrarte todos estos datos (en ocasiones con detalles extendidos), sino que además te permite modificar diversas opciones de configuración de las diversas áreas cubiertas por el programa. WinPatrol's Host-based Intrusion Prevention System (HIPS) takes snapshot of your critical system resources and alerts you to any changes that may occur without your knowledge. WinPatrol was the pioneer in using a heuristic behavioral approach to detecting attacks and violations of your computing environment. It continues to be the most powerful system monitor for its small memory footprint. WinPatrol’s easy tabbed interface allows you to explore deep inside your computer without having to be a computer expert. A one-time investment in WinPatrol PLUS provides a unique experience you won’t find in any other software. As a robust SECURITY MONITOR , WinPatrol will alert you to hijackings, malware attacks and critical changes made to your computer without your permission. WinPatrol PLUS includes our unique R.I.D. technology. As a MULTI PURPOSE SUPPORT UTILITY WinPatrol replaces multiple system utilities with its enhanced functionality. WinPatrol allows you to get a better understanding of what programs are being added to your computer. It monitors important system areas that are commonly altered by many malicious programs. 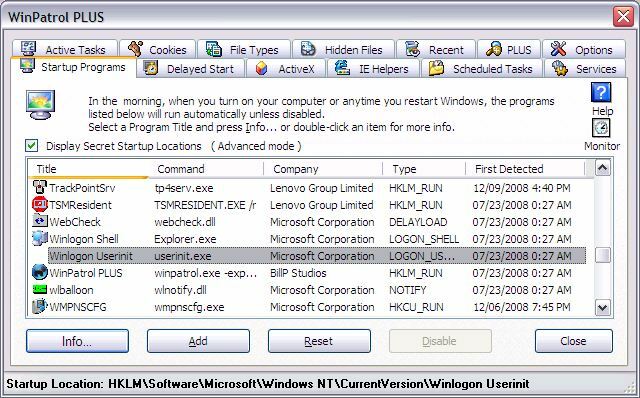 This includes the startup groups (registry and startup folder), cookies and active tasks. You can terminate processes and enable or disable startup programs. The cookie monitoring option allows you to automatically delete cookies based on a keyword found in the cookie name. Additional features include a WHOIS lookup tool and an option to alert you on changes. WinPatrol is easy to understand, yet quiet powerful. Traditional security programs scan your hard drive searching for previously identified threats. WinPatrol takes snapshot of your critical system resources and alerts you to any changes that may occur without your knowledge. You’ll be removing dangerous new programs while others prepare to update their definition/signature data files. 0 Response to "WinPatrol 28.6.2013 (UPDATE)"